Danger and threats (perceived or real) are all around us – terrorists, violence, illegal immigrants, out-of-control cops, a volatile stock market, wild weather … It is understandable that we react to these threats with fear. As individuals and communities, we want and need to reduce these threats as much as possible. We are always seeking security and safety. While we may think that the threats and dangers facing us now are worse than ever, we should remember that there have always been scary challenges. In earlier human history, it was plagues, dictators, natural disasters, and new weapons that terrified people. Some of these challenges have been conquered or tamed, at least in some parts of the world, while others seem to have become exacerbated. Whatever we humans face that threaten us, our natural reaction is fear. In this age of the Internet and instant technology, we seem to know about threats and tragedies instantly, which only heightens our fears. It is important to look at threats, dangers and fear from at least two angles: the factual and solution side and the personal/psychological perspective. How real are the dangers (facts), what are the best actual solutions to them (reactions, policy), and how do our individual emotions influence or even cloud the way we perceive the facts and the policies? In December 2015, National Public Radio aired a fascinating story about the influence of our emotions, especially fear and anger, on crafting public policy. The story relied heavily on research by Jennifer Lerner at Harvard University’s Kennedy School and her colleagues. I would like to introduce another resource and important perspective that may not be well known to the American public. The Enneagram, an ancient system of personality traits that has been rediscovered over the past 30 years or so by psychologists and spiritual directors, can shed crucial light on what may in part be operating among some of us. Viewing our personalities from the Enneagram system can be extremely enlightening. Types Two, Three and Four are in the Feeling Center; types Five, Six and Seven are in the Thinking Center; and types Eight, Nine and One are in the Instinctive Center. According to the Enneagram Institute, “The inclusion of each type in its Center is not arbitrary. Each type results from a particular relationship with a cluster of issues that characterize that Center. Most simply, these issues revolve around a powerful, largely unconscious emotional response to the loss of contact with the core of the self. In the Instinctive Center, the emotion is Anger or Rage. In the Feeling Center, the emotion is Shame, and in the Thinking Center, it is Fear. Of course, all nine types contain all three of these emotions, but in each Center, the personalities of the types are particularly affected by that Center’s emotional theme.” Take the Riso-Hudson Enneagram Type Indicator to see which type is yours. 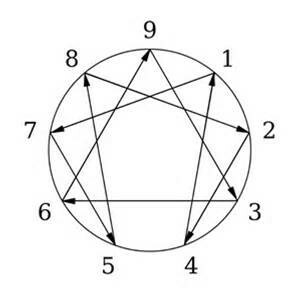 One of the great advantages of the Enneagram system is that it assists the individual not only in identifying his/her basic type but also in learning how to channel the personality into areas of growth and insight. This is done in part by looking at the areas of Integration or Consolation (Growth) and Disintegration or Desolation (Stress). The Disintegration sequence is 1-4-2-8-5-7 – that is, a person who is Type 1 “disintegrates” into the negative characteristics of Type 4 when challenged or threatened; a 4 “disintegrates” to the negatives of Type 2; and so on. (One way to remember the sequence is 1-4 or 14 doubles to 28, and 28 doubles to 57 – or almost so), and 9-6-3-9. The Integration sequence is thus the opposite. So an Eight who wishes to grow will seek to develop more of the healthy traits of a Two; a Five who wishes to grow will seek to develop more of the healthy traits of an Eight; and so on. “Fives have fear about the outer world and about their capacity to cope with it. Thus, they cope with their fear by withdrawing from the world. Fives become secretive, isolated loners who use their minds to penetrate into the nature of the world. Fives hope that eventually, as they understand reality on their own terms, they will be able to rejoin the world and participate in it, but they never feel they know enough to participate with total confidence. Instead, they involve themselves with increasingly complex inner worlds. “Sixes exhibit the most fear of all three types, largely experienced as anxiety, which causes them to be the most out of touch with their own sense of inner knowing and confidence. Unlike Fives, Sixes have trouble trusting their own minds, so they are constantly looking outside themselves for something to make them feel sure of themselves. They might turn to philosophies, beliefs, relationships, jobs, savings, authorities, or any combination of the above. But no matter how many security structures they create, Sixes still feel doubtful and anxious. They may even begin to doubt the very people and beliefs that they have turned to for reassurance. Sixes may also respond to their fear and anxiety by impulsively confronting it— defying their fear in the effort to be free of it. Build a wall between the US and Mexico to keep immigrants out. Allow and encourage school officials and churchgoers to carry weapons. Restrict immigration of Syrian refugees. If, as the research cited above and the NPR story point out, it is dangerous and unadvisable for our strong personal emotions to determine national policy, it would behoove us to pause, step back and examine proposed national solutions as objectively as possible, with the Enneagram in mind. First, is my personality type in the Thinking Center, with its primary stress emotion of fear? If so, it is important to realize that reacting with fear is only one of many ways to respond to stress or threats. Second, how real is the perceived danger or threat? Is it based on facts, statistics, and historical accuracy? Or are there other factors involved in the way the threat is being presented – political aspiration, exaggeration, greed, power, ulterior motives to preserve the status quo? Finally, how rational, pragmatic and doable is the proposed solution being offered? Are there other ways to face the threat instead of (or in conjunction with) fear – compassion, creativity, diplomacy, collaboration, deradicalization? The Enneagram is a powerful tool for personal insight and growth. It would behoove us all to recognize our basic types and examine our automatic reactions to danger and stress – fear, shame or anger. All of these emotions are proper and appropriate in some cases, but public policy must be made on the basis of rationality, practicality, compassion, community, sustainability, and wisdom. Riso, Don Richard and Russ Hudson. Personality Types: Using the Enneagram for Self-Discovery, revised edition. Boston and New York: Houghton Mifflin Company, 1996. Riso, Don Richard and Russ Hudson. Understanding the Enneagram: The Practical Guide to Personality Types, revised edition. Boston and New York: Houghton Mifflin Company, 2000. Rohr, Richard and Andreas Ebert. The Enneagram: A Christian Perspective. New York: Crossroads Publications, 2001.